No I haven't, really. I'm just peeking my head in here to let you know we've been busy celebrating birthdays (2 nephews over the weekend) and one graduation - my niece. 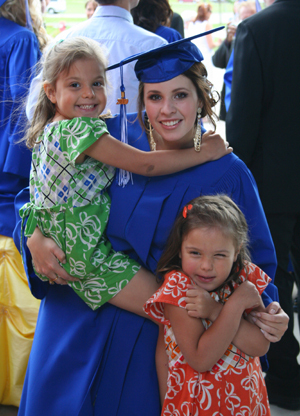 It wasn't that long ago when she was just a wee thing and now here she is on her graduation day holding my two girls. I'm so proud of you Ash, way to go! My hubby's parents also arrived in town for a few weeks so the family time is sure to continue. And finally since I mentioned that day last week I've been on a bit of obsessive reading schedule. The rain over the weekend kept it going strong and well now I can not seem to put the books down. I think I'll just flow with it until life draws me away again, it always does. How's your week going? during your crazy week are you stopping at the Canada Day Artisan sale to sit with your book? And Visit me? we are going to Morning Sound farm for family day on saturday, up to joining us? we going to grand beach sunday we will be east of the lifeguard station on the west beach, with the blue shade umbrella... if you happen to find yourselves in the area. I miss our daily chats! call me this week. lets DO something!!!! !